I have always liked nail polish and loud jewelry. In fact, I remember taking my mom’s Fashion Fair nail polish and painting my nails this garish red when I was in elementary school. Then, being so afraid I would get into trouble, I scraped it off with one of those Afro-fisted black metal picks. I have fond memories of Bonnie Bell’s peel-away nail polish. In high school we could only wear ‘natural’ colors and I was always sneaking some version of brown or vamp on my nails. When I look back on my college graduation photo, I still remember the name of my nail polish (OPI’s Not in Kansas Anymore Red). Actually, I liked that color so much that a friend scooped up four bottles for me eight years ago when it was discontinued. I’m down to the last bottle and a half. Now, I will be honest with you about what some would see as a bad habit. Retail therapy. Having something new (sewn or purchased) makes me feel better when I’m a little down. Well, so does a cold glass of Riesling. But, having shot my fabric wad on the very first day of the month and not wanting to become an alcoholic, I went with a low ticket item. Nail polish, under $3 a bottle on the right websites and arrived today. 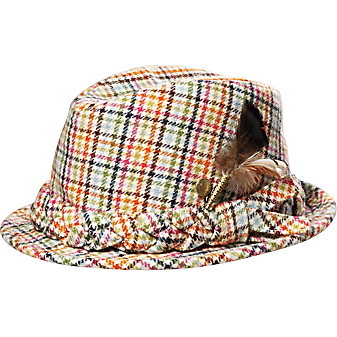 I came across this $198 hat on the Coach site while looking for inspiration for the March ‘Sewn Hat’ contest on PatternReview.com. Totally reminds me of the fedora in the now OOP Vogue 7460. I made this one for my mom over six years ago. Apparently, before I knew how to sew straight lines. Heehee. In searching for photos I found this one of my dad modeling my muslin from six years ago. My head was too big to wear it! Appropriate, as today was his last official day of work. 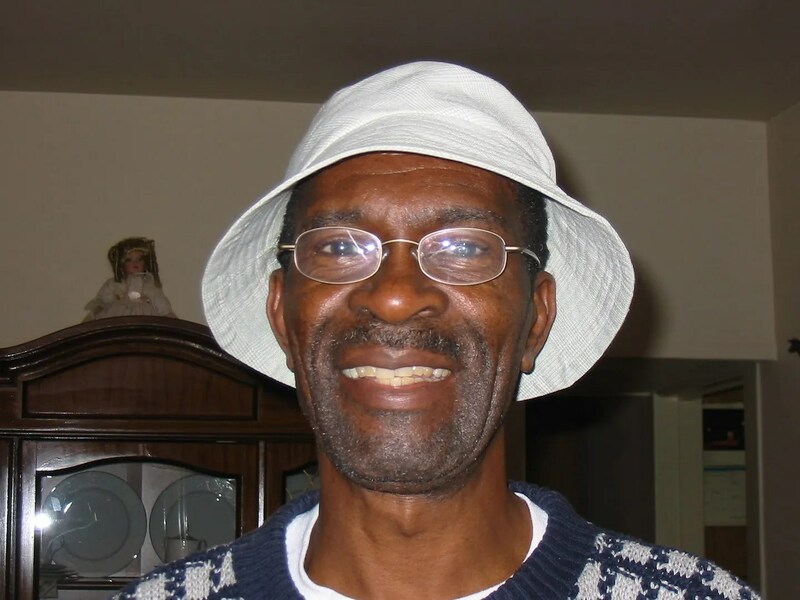 He retired today after 28 years working for the federal system as a nurse. Isn’t he adorable? I hear you about the wine. Shopping though, especially nowadays, leaves me cold. Well, only for clothes. I can still get a pretty good happy going with shoes…. Cidell – I am like you…I have a NEED for funky nail polish although it mainly ends up on the toes. I am not too kind with my fingernails so avoid the polish there. Love the Tiffany blue you are wearing…reminds of the little blue boxes…. By the way, if I have not said so, LOVE your blog….and because of you, I ended up buying some of that Italian silk for ties…so I’m thinking you owe me some cash, lady!! 😉 Actually, never would have ventured into the arena had I not seen your beautiful work. I love nail polish, too. I had acrylic nails and wore a different color every two weeks until about 6 weeks ago. I basically quit having time to do them–it was either sew or do my nails. I miss them. I love that blue polish. I like the blue polish. And Congratulations to your dad! Okay you have to warn me that these types of lines are going to come up! I almost had Mountain Dew everywhere…cause I was laughing so hard!!! Ditto to the nail polish. There is no shame in loving to paint. This is one area of our bodies we can wear all the glittery, girly, vampish colors we dearly love. Congrats to your very handsome DAD. I loved that Bonnie Belle peel-off nailpolish. My mom wouldn’t let me wear nail polish at home so I would put it on in the morning, run off to school, and peel it off before she got back from work. Yay for retirement! That’s wonderful. Your parents must be thrilled. 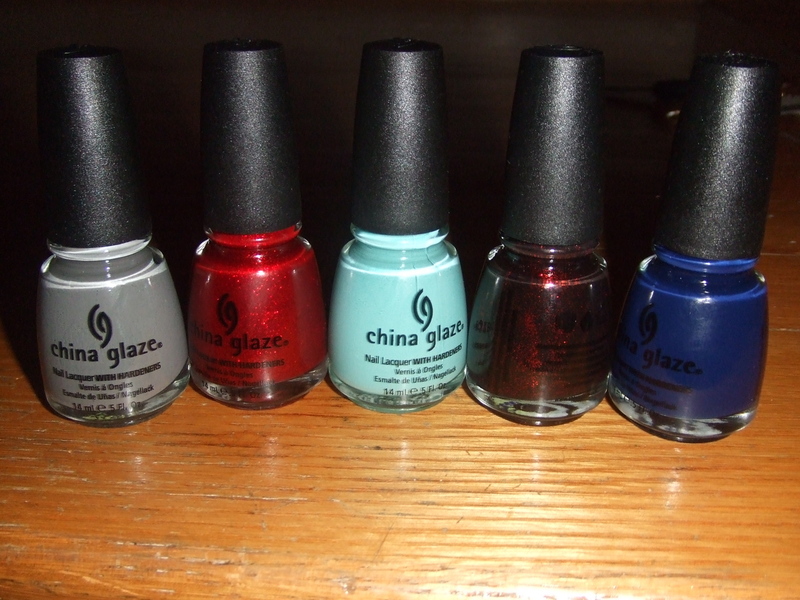 I still haven’t tried China Glaze! I like the upcoming “Summer Days” colors that All Lacquered Up showed recently. I’m going to place an order as soon as those are available. love the tiffany blue! I need to get some! I have raisin purple right now…feel a bit goth. I enjoy nail polish also. I try to justify the polish stash that it can also be used to re-paint buttons that are the right size but wrong colour. Hilarious post. Happy Retirement Cidell’s Dad!!! Shout out from a fellow Ja. Enjoy many many days of sleeping in and no more shift work. I’m hiding this page from my DD or she’ll want me to order those nail polishes for her. Well when I need a little pick me up I head either for the nail polish or the lipsticks…Congratulations to your dad! Great color! And you painted them so perfectly-mine always looks so wonky! Your dad looks fabulous in that muslin hat! Congrats to him on his retirement! My favorite OPI is How to Jamaica Million, which I don’t think is available anymore. It was kind of a silver/purple color that looked really cool — I miss it! Your Dad is adorable. What a cutie pie. I love that color polish on you! The Beauty supply store near me sells China Glaze polishes. 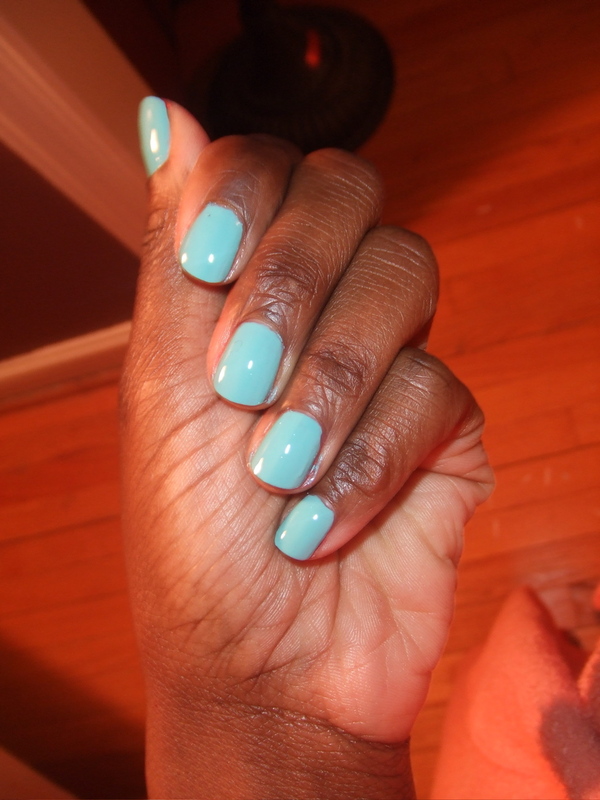 I used to do “French” manicures with a solid color like that blue or a sunny yellow, with white tips. It’s so fun when you need a pickup in mid-winter! I’ll see if I can find you a similar tweed. And your dad is such a cutie! I’m not a nail polish kind of girl, but I love your style! What is it with Breakfast at Tiffany’s? I don’t remember it as more racist than a lot of other icky stuff of the era (which was, let it be said, racist enough to be worth the label), but I do remember it as a pointless movie about really, really shallow people. Well, OK, and a bunch of really great clothes. Hmmm . . . does that make ME shallow?? Ooh, I love the “For Audrey” polish too! For new years I decided to do a “Tiffany’s” pedicure with it, by putting just a little cluster of rhinestones on top of it while it was still tacky, down near the base of my big toenail. Then a layer of clear nail polish to seal it. It looked SO cute. Yeah, Dad is adorable. Hope he enjoys retirement. My father in law never retired; couldn’t stand to do nothing. Mother in law’s cruises didn’t count as doing something. I don’t like bright nail polish, but my girls sure do! They match polish to outfits. I wear muted colors, if any at all…sad but true. Congratulate your dad. Now, he moves off to be with Mom, doesn’t he? I love the part about the sewing lines, too – very dry. Also, I love those quilty doo-dads that show up next to the comments. “shot my fabric wad” – priceless!!! You are my hero! PS I’m wearing dark plum polish on my toes. I love purple! I will admit to ‘nail polish therapy’ myself, it sure is one of the cheapest pick me ups there is. Never tried china glaze though! The robin’s egg blue is sooo fun, and I had no idea you were such an accomplished polish-applier. I’m impressed. Your Dad is adorable btw. Did you notice that the “for Audrey” Tiffany colour co-ordinates perfectly with the coach hat?! 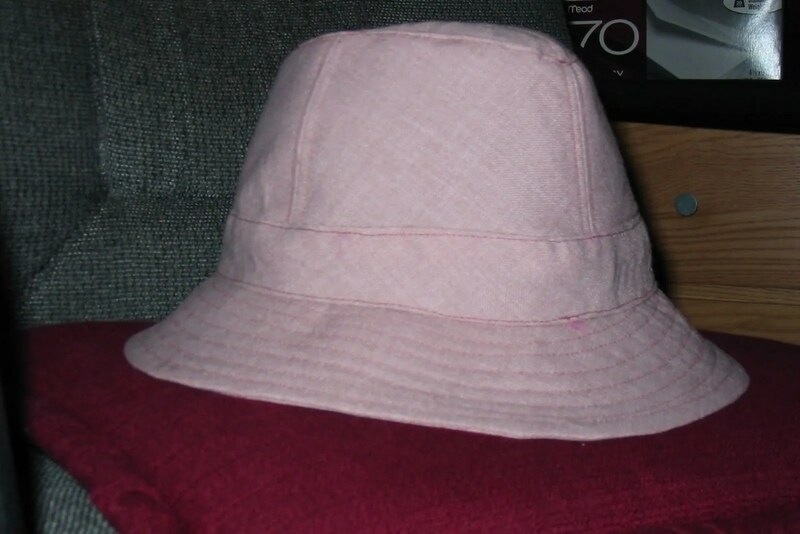 You totally need to make that hat – in as close as fabric as can be found! I bought Breakfast at Tiffany’s on DVD the other day. I watched a “making of” feature on the disc. They did say they now wished they could go back and not have used Mickey Rooney to play the Japanese photographer. But I’ve never read the book, so don’t know what else might be in there. To Noile: I think the point of it was to show that they were actually only superficially shallow and hiding their deeper selves in a 60s-post-modernist sort of way. And you can’t deny that “Moon River” is a beautiful song. Keep posting your nail polish colors! I love all the new colors coming out now, but it’s hard to guess how many of them will look on brown skin. I think that blue is beautiful on you! Definitely would dazzle on some feets. Look at your handsome dad! I love that polish! I used to wear blue polish all the time when my son was playing ball – team spirit, you know (that’s my story…). I still occasionally wear it on my toes but just because I am way too lazy these days to wear color on my fingers. Love your dad’s hat too – men are always so appreciative when we actually sew something for them.